Our whitewater expeditions range from beginner level trips for people getting to grips with moving water through to more advanced level trips for more experienced paddlers. If you’re unsure about whether a trip is right for you, contact the event organiser to see what’s level of paddling is expected. These trips can often be tuned to suit the ability of individual paddlers and the exact river or section of river will be chosen by the coach depending on levels and the group. Don’t be frightened to ask! We may also choose alternate rivers or postpone trips depending on river levels, weather conditions and rainfall. 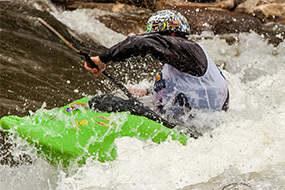 A day trip at the Yat suitable for youngsters and adults intro to white water (must be confident capsizing kayak with a deck), plus experienced paddlers wanting a chance to refresh their skills, you will get wet, you will have fun. Facilities for non paddlers too. For more information, contact Paul Jeffs. Our first planned grade 2 whitewater day trip down the Barle this season. This is an ideal follow-on trip for paddlers after the Yat or Shepperton, for anyone wanting to refresh skills, blow the cobwebs away or enjoy a day on the river in fab scenery. Contact Paul Jeffs for more information.